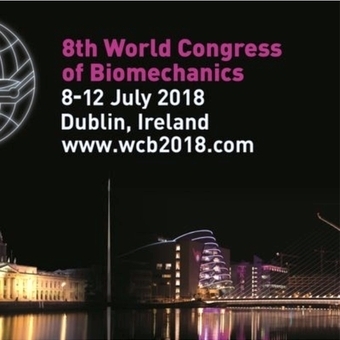 Four scientific posters on research topics conducted at the TORT Centre were presented at the World Congress of Biomechanics in Dublin, Ireland. The Congress took place from 8 - 12 July, 2018 in the Convention Centre, Dublin. The World Congress of Biomechanics is held once every 4 years and is the premier meeting worldwide in its field. Nawaf Al Khashram, a PhD student studying gait analysis in cerebral palsy patients, represented the Department of Orthopaedic & Trauma Surgery in Dr Weijie Wang’s absence. Nawaf Al Khashram at the poster meeting. “I would like to thank Dr Weijie Wang for getting four scientific posters accepted for presentation at this prestigious congress. I’d also like to thank Nawaf for representing the Department skilfully and confidently. Here at the Institute of Motion Analysis & Research (IMAR) we, together with our exceptionally talented students, carry out important biomechanical research into a wide variety of topics that ultimately enhance patient life quality. One of IMAR’s greatest strengths lies in the reliability, longevity and evolving expertise of its dedicated team. The vast majority of employees at the Institute have been with us for over 10 years and continue to break new ground clinically and in the field of research”.